This entry was posted in RU and tagged блог on October 26, 2011 by FEMEN. This entry was posted in RU and tagged блог on October 24, 2011 by FEMEN. This entry was posted in RU and tagged блог on October 23, 2011 by FEMEN. This entry was posted in RU and tagged блог on October 21, 2011 by FEMEN. This entry was posted in RU and tagged блог on October 20, 2011 by FEMEN. This entry was posted in RU and tagged блог on October 19, 2011 by FEMEN. ПМС №8. Против холодных батарей. 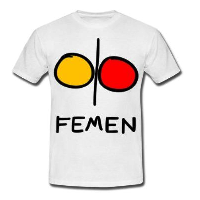 This entry was posted in RU and tagged блог on October 17, 2011 by FEMEN. This entry was posted in RU and tagged блог on October 16, 2011 by FEMEN. This entry was posted in RU and tagged блог on October 14, 2011 by FEMEN. This entry was posted in RU and tagged блог on October 11, 2011 by FEMEN.